Statement of Purpose: The Autism Society of Boulder County (ASBC) is a non-profit, all-volunteer organization that offers free services to 2,000 area families coping with the daily realities and stresses of autism. ASBC's Mission is to help individuals with autism spectrum disorders and their families develop a strong, united community by creating opportunities for people to connect, share experiences and build new relationships. We support continuing education among local service providers, schools and families, and are building programs for adolescent and adult populations to expand their opportunities. 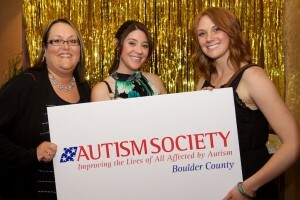 Accomplishments: In the last year, ASBC has increased respite grants for families by 500%, has helped send 10 children to autism-focused summer camps, and has developed a support program for siblings of individuals with autism to be launched soon in three different locations in the Boulder/Broomfield area.